Mumbai, 2017-Mar-08 — /Travel PR News/ — Jet Airways, India’s full-service premier international airline and Fiji Airways, Fiji’s National Airline, today (Mar 6, 2017) announced a codeshare partnership which offers guests travelling on both carriers convenient and seamless connectivity between India and Fiji via Singapore and Hong Kong. The codeshare agreement, a first-of-its-kind between the airlines of the two countries, will address the growing demand for travel between India and Fiji. Jet Airways will place its ‘9W’ code on Fiji Airways’ flights from Singapore and Hong Kong to Nadi, and Fiji Airways will place its ‘FJ’ code on Jet Airways’ services between Singapore and Mumbai, Delhi and Chennai as well as between Hong Kong and Mumbai & Delhi. All codeshare flights will allow through check-in to the final destination of any journey. What’s more, JetPrivilege members will also be able to accrue and redeem JPMiles on the codeshare flights operated by Fiji Airways flights; and the accrued miles will count towards their tier status as well. Codeshare bookings are now open for sale for travel effective March 09, 2017. Speaking on behalf of the Fijian Government – the majority shareholder of Fiji Airways – the Attorney-General, Minister for Economy and Minister in charge of Civil Aviation, Hon. Aiyaz Sayed-Khaiyum described the new code-share agreement as a major boost to relations between the two countries. 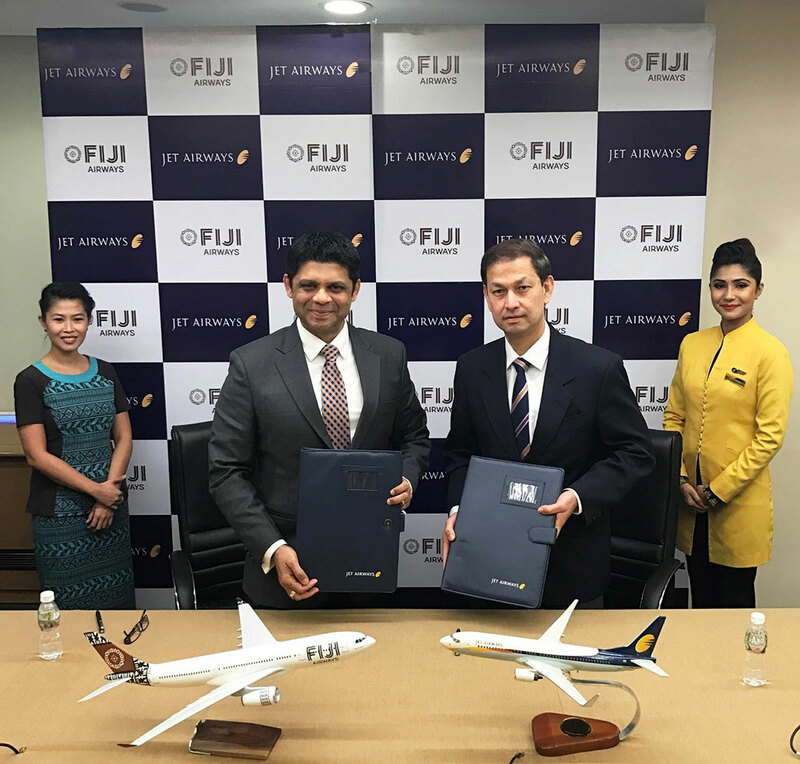 “The seamless connectivity that this offers for travellers between Fiji and Jet Airways destinations on the Subcontinent and beyond opens up all sorts of possibilities for tourism and trade. Fiji is especially keen to attract more investment from India and the other countries serviced by Jet Airways and this makes the journey in both directions that much easier,” he said. Jet Airways is India’s premier international airline which operates direct flights to 66 destinations, including India and overseas. Jet Airways’ robust domestic India network spans the length and breadth of the country covering metro cities, state capitals and emerging destinations. Beyond India, Jet Airways operates flights to key international destinations in South East Asia, South Asia, Middle East, Europe and North America. The Jet Airways Group currently operates a fleet of 112 aircraft, comprising Boeing 777-300 ERs, Airbus A330-200/300, Next Generation Boeing 737s (700/800/900) and ATR 72-500/600s. Founded in 1951, Fiji Airways Group comprises of Fiji Airways, Fiji’s National Airline and its subsidiaries: Fiji Link, its domestic and regional carrier, acific Call Comm Ltd, and a 38.75% stake in the Sofitel Fiji Resort & Spa on Denarau Island, Nadi. From its hubs at Nadi and Suva International Airports, Fiji Airways and Fiji Link serve 69 destinations in 15 countries (including code-share). Destinations include Fiji, Australia, New Zealand, the US, Canada, the UK, Hong Kong, Singapore, India, Samoa, Tonga, Tuvalu, Kiribati, Vanuatu and Solomon Islands. The Fiji Airways Group brings in 64 percent of all visitors who fly to Fiji, employs over 1000 employees, and earns revenues of over FJD$815 million (USD $390m). Fiji Airways rebranded from Air Pacific in June 2013. Visit www.fijiairways.com for more information. This entry was posted in Airlines, Business, Flights, Travel, Travel Management, Travelers and tagged Aiyaz Sayed-Khaiyum, Andre Viljoen, codeshare partnership, Fiji Airways, Gaurang Shetty, Jet Airways. Bookmark the permalink.